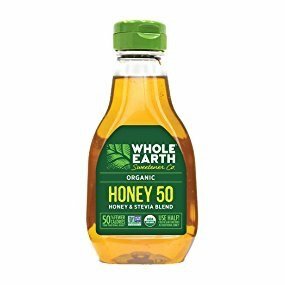 Amazon.com offers the Whole Earth Sweetener Organic Honey & Stevia Blend Low-Calorie 12-Ounce for $6.17. Features：The Whole Earth Sweetener Organic Honey & Stevia Blend is ideal for sweetening tea, coffee and other beverages as well as oatmeal and baked goods. You can use this blend anywhere you would use honey or sugar; use 1/2 tablespoon in place of 1 tablespoon of honey for the same great taste at half the calories. We use only USDA Organic, Non-GMO Project Verified ingredients to ensure the health and well-being of your family. Our blend contains no chemicals or preservatives - only three simple ingredients: organic honey, water and organic stevia leaf. This product should not be given to infants under 1 year of age. Whole Earth Sweetener Organic Honey & Stevia Blend is gluten-free and Kosher to fit dietary needs. Whole Earth Sweetener is dedicated to providing our customers with a wide variety of great tasting low and 0-calorie sweeteners made from the best ingredients and using conscientious practices.